You would think I’ve made enough rainbow cakes, but I simply couldn’t resist sharing one more epic rainbow cake recipe with you. 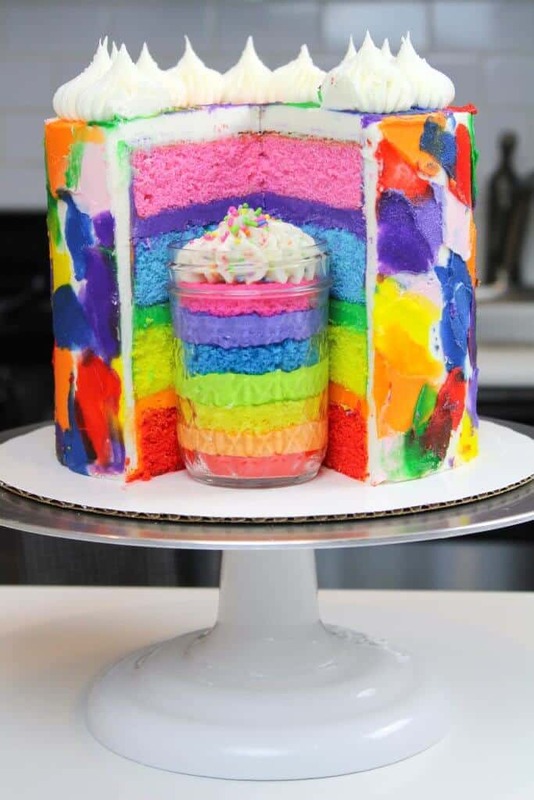 I am a big fan of color, but hate all the dishes rainbow cakes make! Making six different colors of cake batter is such a pain. 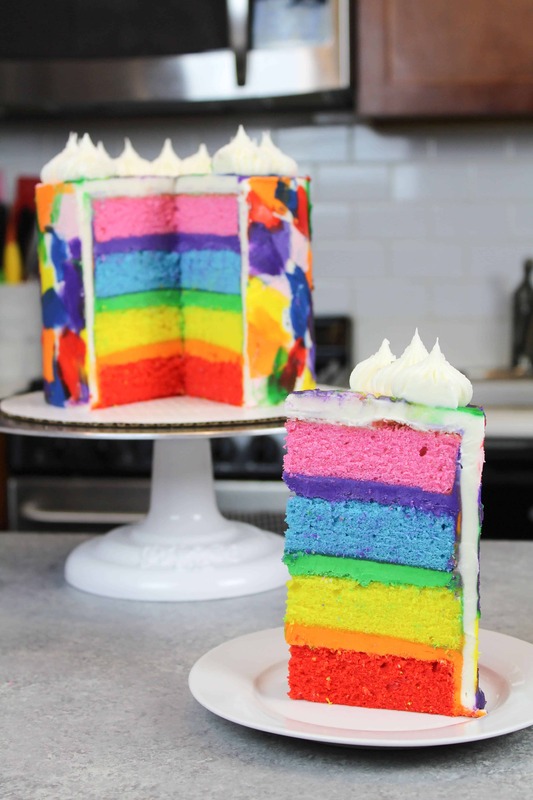 To mix things up, this rainbow layer cake creates the rainbow using both the cake layers AND the frosting!! While I’m fully aware of ROYGBV, I went a little wild and threw a pink cake layer on top of this rainbow cake. My vanilla layer cake recipe makes four, seven-inch layers, and I didnt want to waste any batter. 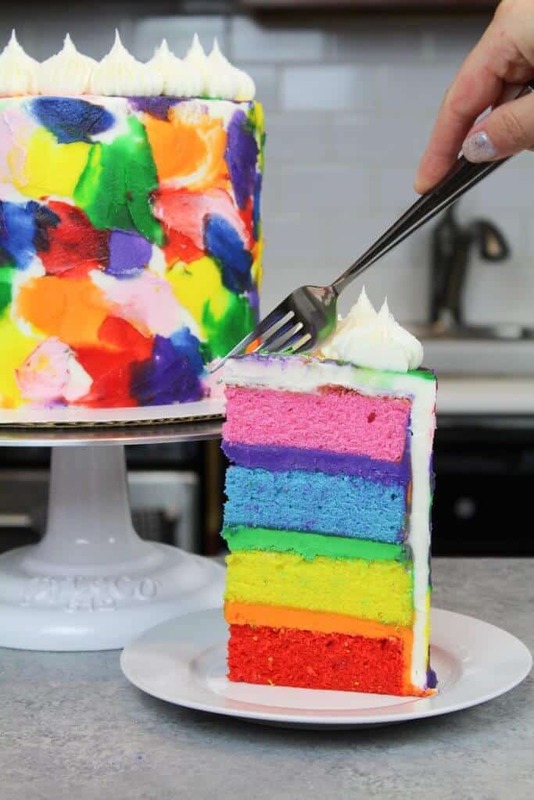 However, you could make three, eight-inch cake layers, and not have a fourth cake layer if you really want to stick to colors of the visual spectrum. It’s funny, because whenever I make a cake, I feel like I’m already bracing myself for negative comments from people. Not so much on here (all of you are wonderful! ), but more so on the videos of this cake that I’ll share on Instagram and YouTube. It’s just a part of my thought process now, especially when I’m blogging or editing videos. But you know what? I like the pink layer in this cake!!! And the world is just going to have to deal with that. 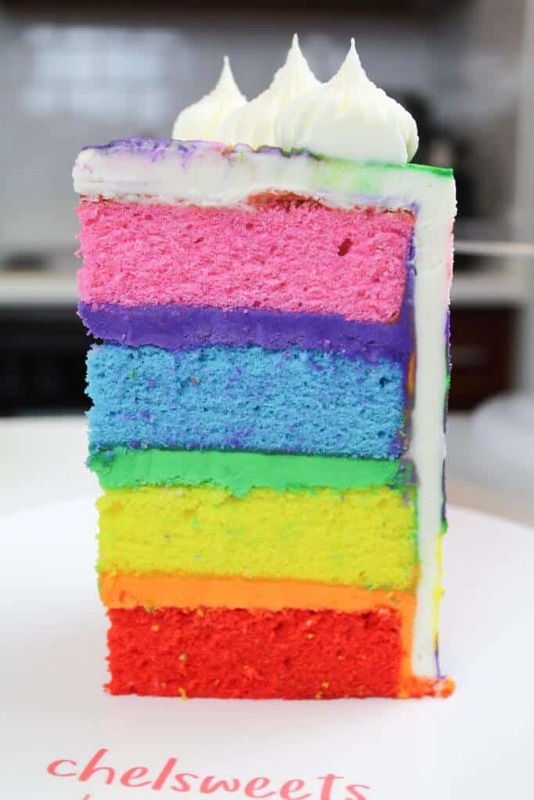 How Do You Make Such Vibrant Cake Layers and Frosting? 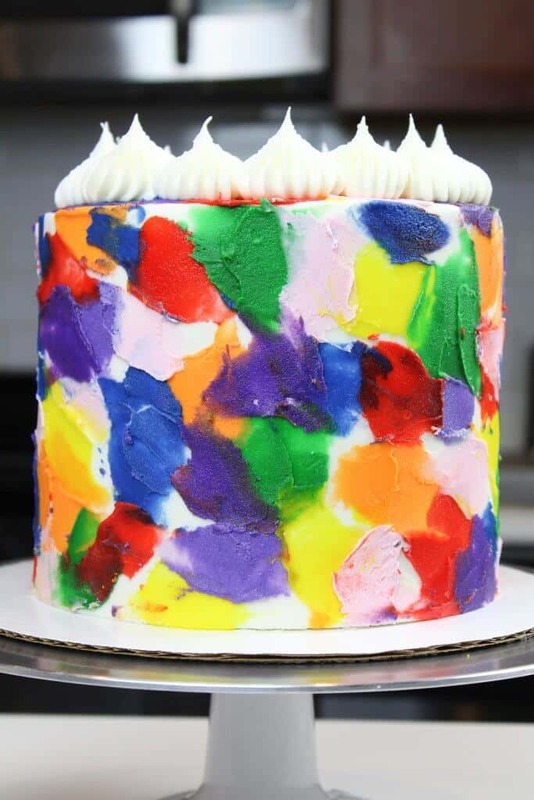 I used gel food coloring to color both my cake layers and my frosting in this rainbow cake recipe. Liquid food coloring can work too, but you won’t be able to get the same vibrant colors. You also can throw off the consistency of the vanilla cake batter if you add too much liquid food coloring. I highly recommend using gel food coloring. Gel food coloring is incredibly concentrated, so it allows you to use less. A couple drops will create beautiful, bright colors. Gel food coloring is also thicker, and won’t change the consistency of the cake batter. Americolor gel food coloring is my favorite brand, and I order bottles of it on amazon. I’m super particular, but most brand work pretty well. In addition to recommending gel food coloring, I recommend getting gel food coloring that comes in a squirt bottle, rather than a small tub. It’s much easier to use, and a lot less messy. I use large squirt bottles of gel food coloring, which are much better deal per oz. These bottles seem to last forever (even for me! ), and I love not having to constantly order more tiny bottles. However, I think I use gel food coloring more than the average home baker. If you aren’t as into it or use it on a more one off basis but you can also purchase smaller squirt bottles online, which come in both 0.75 oz. and 4.5 oz bottles. This rainbow cake was made as part of an amazing collaboration with my friend Dani! Her business is called Jars By Dani, and she creates amazing and delicious jars of cake. We teamed up this April to make a special flavor together. After lots of brainstorming, we settled on this stunning rainbow cake design. She ships nationwide, and if you feel like ordering one of our jars, you can check them out here. If you try this rainbow cake recipe, please tag me @chelsweets, and use the #chelsweets so that I can see your amazing creations! This vanilla cake recipe is made in one bowl, and is super moist! One batch makes 3, 8-inch cake layers, and is frosted with vanilla buttercream frosting. Preheat oven to 350°F. Line four 7 inch pans pans with parchment rounds, and grease with a light spray of non-stick cooking spray. Divide the batter evenly between four bowls (about 450 grams of batter per bowl). Create red, yellow, blue and pink batter using a couple drops of gel food coloring. Mix by hand with a spatula until the batter is evenly colored. Start with the red cake layer on the bottom. Top with a thick layer of orange buttercream. Leave about 1/4 of a cup of frosting in the bowl, to decorate the sides of the cake with later. Top with the yellow cake layer, then frost with the green buttercream, reserving a tiny bit of green buttercream. Next add the blue cake layer and top with some purple buttercream (leaving a bit for the decoration later). Top the cake with the pink cake layer, placing it upside down to make it easier to frost (with the caramelization from the bottom of the pan facing upward). In four other small bowls, color about 1/2 cup of frosting to make red, yellow, blue, and pink buttercream. Using a small offset spatula, spread dabs of each color of frosting around the chilled cake. Feel free to overlap and have with the step! Previous PostHow Long Does Buttercream Last?